I am in the process of collecting ideas for a very low noise benchtop power supply to be used for developing precision analog circuits. It will provide three isolated channels: 2 * 0V .. 24V / 1A for the analog circuits and 1 * 0V .. 5V / 2A for digital circuits. The target for maximum noise voltage is less than 100uV. No high frequency switching noise is allowed. The straight forward design would be to use rechargeable batteries and linear regulators. Batteries would not generate any ripple or hum, so essentially the power supply should be quite noiseless and with careful linear regulator selection and design the 100uV noise level should be realistic. The other option is to use traditional design with transformer(s), rectifiers, capacitors and linear regulators. Selecting transformers with tapped output would reduce any heat problems associated to linear regulators. This design should be pretty noiseless as well, but requires some relay or switch logic for selecting proper transformer taps. There are few designs floating around which utilize triac-controlled preregulator feeding the linear regulator. These design doesn't require tapped transformers and they should have a good efficiency and generate very little heat. However, I am not sure how noiseless these triac-controlled preregulators are. Both the batteries and transformers are quite bulky, and I was thinking is there any clever way to reduce sized and weight and keep the noise level down. Then I came up with a (quite complex) idea which might work: Let's take one power supply of 30V / 3A and three adjustable buck-regulators, one for each output channel. 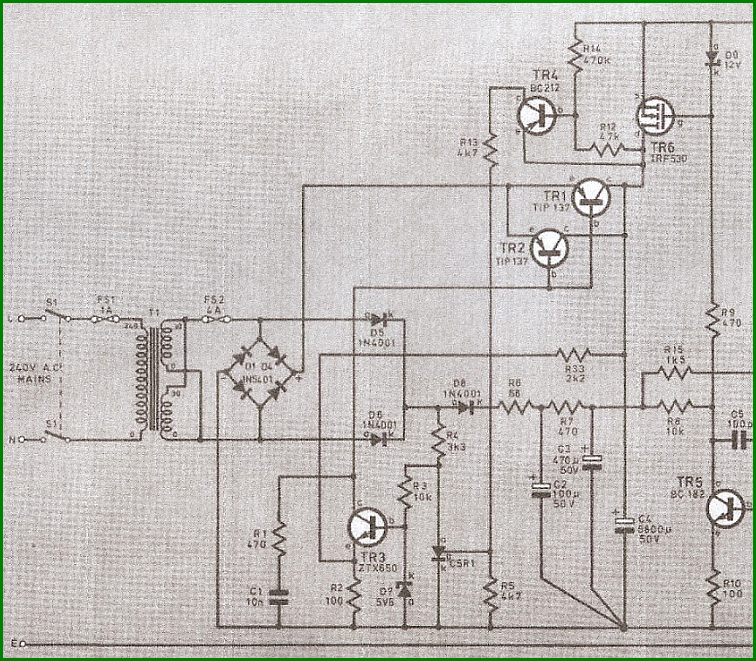 The buck-regulators will provide adjustable power supply to three power op amps driven by good quality 30kHz sine wave. Each power op amp will drive a 1:1 transformer driving a rectifier, filtering capacitors and the linear post-regulator. There will be required some opto-isolated feedback from the output back to the buck-regulators. Using the 30kHz sine wave will keep filtering capacitor size small and less bulky. This design is a mix of switching preregulator and linear regulator, and the 30kHz transformers are used for isolation and noise filtering. How does this sound to you - other than this is a bit complex solution for a quite simple problem. However, this solution is quite flexible and scalable, and it will keep the size and generated heat down . Do you think that this solution would be able to provide low noise output, or do you think that buck-regulators might still emit too much switching noise to the secondary side of the 30kHz transformer so that the 100uV design target is difficult to achieve? Sounds complicated and you still have relatively poor efficiency. Linear amplifier driving ainewave is something like 60% max effiency plus all the other losses. I would go for brute force, no fancy tapped Transformers or anything. Just linear regulator with 100w cooling capacity. Maybe a capacitor multiplier as a preregulator.. I prefer to go with 3 fixed independent flyback or forward converters, each followed by a buck converter. Then, use linear pre-regulator and linear regulators to being down your output noise. The reason for this is driving sine wave using opamps is low efficiency, and it generated tons of heat. Also, filtering 30kHz is not easier than filtering 1MHz. Going high frequency might be a better choice, if you can have access to good quality inductors and capacitors. Just think of it, for the same inductance, higher frequency gives you lower ripple current, and higher output high frequency blocking. Seems to be quite complicated a solution for a multi-faceted issue. If you are concerned about ripple out of a smps, you can probably design a linear regulator with good PSRR at high frequencies. But in general, high speed high power feedback loops driving a dynamic load are hell. Most low-noise will preregulator running on mains frequency. Implemented on the MOSFET, not on the triac. Since the switching frequency is low, you can specifically reduce the slew rate, and it will not affect much on efficiency. This is done, for example, a Agilent U8002A. In my PSU I use multi-level output stage. This is similar to switching windings, but has excellent dynamics. I prefer to go with 3 fixed independent flyback or forward converters, each followed by a buck converter. If it's a simple flyback module why bother with the buck converter? The optocoupler feedback is trivial to adapt for variable output voltage. Because to keep a converter running is easy, but try to keep it in its best shape is hard. Buck topology can easily operate in all CCM if synchronous rectification is used. You can not make a bidirectional sync flyback or forward converter easily. Also, the transfer function of a flyback, or buck-boost converter is very tricky, that makes controlling it with a wide dynamic range harder. Also, for a flyback, equivalent winding current equals to the sum of input current and output current. If a wide output range is used, the transformer winding loss will be extremely high. A bang bang DCM fly back is always in the same bad shape ... but ripple at those frequencies is easy to clear up. Why care about the efficiency of the flyback going down at lower voltages? The losses in Watt are still going to go down, so it won't become a problem for the supply ... and Kalvin clearly doesn't care that much about overall efficiency. Of course. If efficiency is not the utmost requirement, and fast dynamic response is not required, you can definitely spare the buck stage. Why it has to be in DCM? The output voltage is not so high, so recovery charge is not a big deal. If efficiency doesn't matter, then RMS winding current doesn't matter either. Ehhhhh, I was talking about the 24V 1A project. If it was 300W, I would go DCM for sure, or another topology. I changed it a little and made a test circuit with a LT1083. Q3 measures the diverence between the input and the output of a regulator, here a LT1083. When the difference is large enough, then Q3 will give a pulse to the gate of the thyristor. Now T1 stops the charging of the buffer capacitor C1. It differs from a "normal" thyristor circuit is, that the charging is stopped, when sufficient energie is present in C1. Charging will start again at each zero crossing and is switched off again when sufficient energie is in C1. A typical thyristor circuit turns "random" on, this would create interference pulses, there are large coils necessary to suppress current spikes. R4 and C3 controles the switching off, adjusti these values for minimum noise from the transformer. If you make C3 to large, the noise( al little, much better than a normal Thyristor controler) is gone, but the dissipation in the IRF5210 wil be Higher. And then this, do NOT use a normal bridge circuit if you want a high efficiency powersupply, use a LT4320 electronic Bridge controler. On the same website/topic you can see some testing i have done with a LT4320, its a beautiful IC! Thanks guys for you insight and suggestions. @mzzj: Yes, like you said the op amp generating a sine wave has quite low efficiency 60%, and the overall efficiency might be close to the original brute force approach. Let's say the output voltage is set to 12V @ 1A. The dissipation in the brute force, direct battery-operated linear regulator is 12W, giving efficiency of 50%. With the lower output voltages the efficiency will drop even more. For example with the 5V output voltage the power loss in the linear regulator is 19W. With a tapped transformer the voltage drop across the linear regulator would be typically 2-4 volts depending of the tapping available, giving typical dissipation of 2W - 4W. Using some sort of triac- or MOSFET-driven pre-regulator, one could reach similar dissipation of 2W - 4W. @blueskull: I would like to avoid any SMPS if possible. Although my idea is to use a buck converter as an adjustable pre-regulator feeding the op amps seems counter-intuitive in this regard, I guess that the op amp and the 1:1 transformer should filter out the switching noise quite well. Of course, I can be totally wrong here and the switching noise from the buck converter gets transferred though the op amp, transformer, rectifier, filtering and the linear post-regulator to the output destroying my limit for the 100uV output noise, as I don't have tested this yet. This is something I don't have experience and I am just guessing here. @dannyf: My intention is to keep the feedback from the input of the linear post-regulator to the pre-regulating buck-converter as lazy as possible, and use the linear post-regulator as the main controlling device. In this way I should be able to avoid the hellish control loop. The linear post-regulator would be fed by a beefy capacitor providing enough energy during load transients and while the buck regulator is trying to catch up and keep the capacitor filled. @Liv: Thank you for your suggestion. I need to take a look at Agilent U8002A. I tried to estimate the power loss of the op amp driven by a sine wave at 12V and 1A RMS. In this case the power supply voltage needs to be 16V as the power op amps require quite a good headroom. The typically efficiency for driving sine wave is said to be 60%. The direct approximation for the losses is 16V * 1A * 0.4 = 6.5W. This is not terribly bad unless my estimation is totally wrong. For 5V the losses in the op amp are 9V * 1A * 0.4 = 3.6W. At 24V the losses increase to 28V * 1A * 0.4 = 11W. @blackdog: Nice design. I need to take some time studying it. I have been thinking something like http://cds.linear.com/docs/en/application-note/an32f.pdf figures 5 and 8. Those designs seem quite simple and encouraging. Funny how they have an answer to almost any analog problems ever existed. I see 30uV noise figures on page 5. I'm sure somehow you can adopt design to work in the 21 century. Indeed. I have read this great application note and the original idea of using the sine wave came from the design "Ultralow Noise 5V to ±15V Converter" - the 30uV output noise is something to go for. However, I wanted to be able the adjust the secondary voltage in order to reduce the heat in the linear post regulator, thus the idea of using power op amps and variable supply voltage for the op amps = tracking pre-regulator. However, the application note states that the efficiency is only 30%. Where exactly do you need this high current and low noise? I'm asking, because when I need a low noise power supply, the only way to do it is to have it onboard with the precision circuits. I mean it is kinda pointless to have a low noise circuit, and then connect it to it's PSU with 1 meter cable and create a bad PSR(R) with the cable. Even it is 4 wire PSU, you still have loop compensation and other problems. An onboard good old LM317 or a 78xx creates a power supply which is usually much better than any remote PSU. The initial need is to have an adjustable, low noise benchtop power supply for precision analog systems prototyping and development. Like I stated in my first posting, using the rechargeable batteries are good starting point and I have used them with great success: No switching noise what so ever. In reality, actual power requirements are quite modest as a typical measurement circuit will consume only tens of milliamperes to 100mA and typical voltage range is +/- 5V ... +/- 15V. The dynamic range in the measurement systems is 80 dB or more, so the power supply must be noiseless. I was hoping that I could stretch my real requirements a bit and create a low noise power supply with a bit higher maximum current range up to 1A and voltage range up to 24V. Maybe this is too tall order anyway, and I will do something more conservative and split the design for two different power supplies altogether. As you stated correctly, the onboard LM317 or any other similar regulator is hard to beat, and I am not really trying to do that - Typically these measurement devices will be portable, handheld devices, and they will be powered from rechargeable batteries. During the development and prototyping I would like to substitute the real power supply with something more flexible which would allow me to see how the system performs under different power conditions etc. etc. My intention here is to collect information from the knowledgeable people on this forum, and trying to figure out whether my ideas are realizable. Maybe someone else will also learn from this discussion, as I will. If you want a "Low Noise" Bench Supply, stay away from the schematic's like the LT designs. The design from Mark-Stuart (not mine) is one of the view you can use for low noise prereg and high efficiency. Take some time and read my notes on the link on about my powersupply design. If you want "Low Noise", this design give you low noise, about 5uV @ 22Khz bandwith. No Power on / Power off transients, fast acting current control etc. How about just amplifying a voltage reference? Is it going to be noisier than all the complicated contraption? Thank you for your valuable input. Especially i would like to thank blackdog for spending some time on this issue. I will go for the design based on tapped transformer as it will be a simple, straightforward solution for the low noise power supply with easy thermal management. In one of my earlier posts I was referring to LT1970A "500mA Power Op Amp with Adjustable Precision Current Limit". I will prototype the parts for this design. Is there an English version or should we use google translator ? I need a real 30V PSU and low noise could help me to do certain practices that usually I need to do in our crowded class. 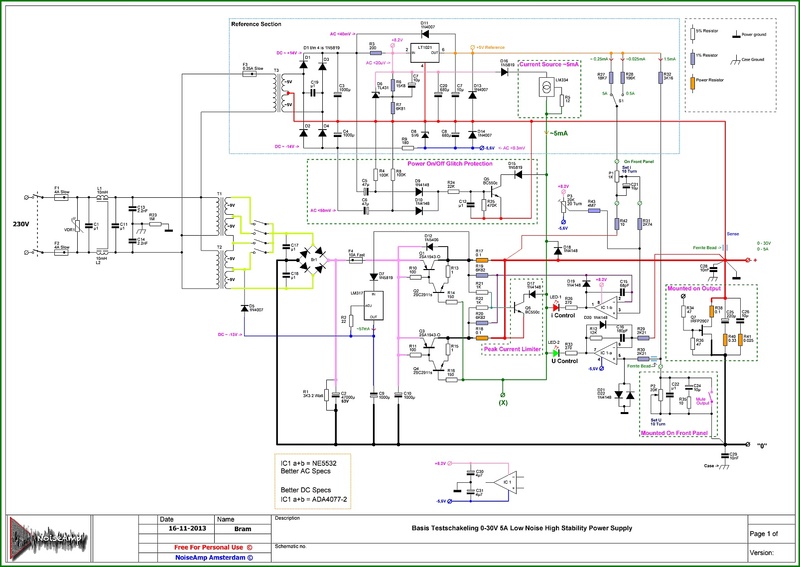 How did you draw that very pretty schematic? I'm forced to use Eagle at my vocational training school, it's ugly as hell. Is that LT1021 expensive to get? What advantage has over discrete component or other part? How much it it would cost the BOM? Is that a relay in the second transformer? Do you use two transformers? Is a toroid transformer some improvement in the device? Sorry for too many questions. Thanks a lot for your project! No problem! Thanks for your reply! 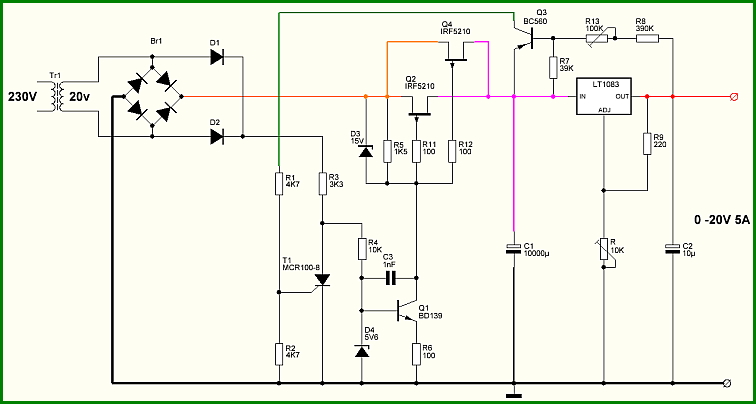 Nice schematic editor and CHEAP! Where's the trick compared to stuff like Eagle, DipTrace and Altium?